Statutory information – Statutory information may include licenses, certifications in OHS or other areas, background checks, or other materials required to be documented. Specialist areas of teaching may also require certification in specific State requirements may vary depending on the type and level of schooling involved. Qualifications and relevant experience – Every teaching role has a specific range of requirements in terms of qualifications and experience. These requirements are set by the state qualification standards and the school’s requirements for teaching skills and expertise. Header – Your name, phone, email, and address. Personal profile – This is an introductory section, describing you and your work. Skills – This section is extremely important. Your skills list needs to address the specific requirements of the jobs for which you apply. Be sure to cross check your resume against listed skills requirements. Qualifications and mandatory documentation – State your qualifications in the standard academic form, describing the degree, honors, institution, and year of qualification. Work history – Your work history needs to be tailored to show appropriate experience for the positions for which you apply. Never submit a One Size Fits All resume. Target your resume to every job application. It’s not hard to write an effective English teacher resume using a functional resume format. The major problem is making sure that quality of information supplied is competitive and makes your resume stand out. Standout skills – The skills part of your resume is the best way of ensuring your resume stands out. If you have superior skills, you’re a natural selection for the job. Use performance indicators to demonstrate productivity and achievements. Experience – Schools need competent people. Focus on showing relevant experience which meets the needs of the job. At high school level, anticipated job growth for school teachers in the US to 2022 is 6%, or 52,900. This number varies depending on the type and level of teaching, and does not include Special Education teachers. Creating the best resume for school applications may seem a bit daunting but with our service we can help you get the greatest results that will give you a leg up over the competition. You may not realize it but you need a wonderful resume for school applications. Whether you’re going to private college or a public college, whether it’s a small liberal arts school or a massive state behemoth, resumes for college are an absolute must. Why? The admissions board wants to know who you are and what you have done. A resume for school applications shows that you have done some things in your spare time besides playing video games. What hobbies do you have? What sports have you played? Most importantly, a resume for school applications should highlight the skills you have gained and any volunteer work you have done. This helps the admissions board get a clearer picture of who you are as a person. That’s why our service is what you need! Our resume for school service is here to help you get into the school of your dreams. Resumes for college seem a bit daunting at first glance but they don’t need to be when you let us help. Our resume for school service employs dozens of highly trained and highly educated individuals who can help you craft the very best resumes for college available anywhere! Don’t discover that you’ve not been accepted into that school you’ve always longed to attend! Let our resume for school service help walk you through the process of creating a sterling resume that will stick out among the competition. Resumes for college are important but what about after you make it to college? That’s when resumes for a job become extremely important, as well! You may need resumes for a job if you’re looking for something part-time to earn extra cash, or looking for something full-time for the summer break. Whatever the reason, our service helps with both a resume for school and resumes for a job! Don’t wait, contact us today. Writing the very best resume for teachers is more viable than ever with our resumes for teachers writing service, dedicated to helping some of the most important people in a child’s life to get the jobs they deserve. A resume for teachers job is different than other resumes because of what it needs to highlight, and that’s why a candidate for a teaching position can’t afford to send out their resume for teachers jobs without letting us take a look at it first. It never hurts to have that extra leg up over the competition, and when you’re writing a resume for a teacher you need all the help you can get. After all, despite being an enormously important job, they just aren’t paid as much as they deserve. Our resume for teachers service streamlines the entire process of putting together a great resume that will impress recruiters, superintendent and principles the world over. When you look for a resume for teacher jobs, you’re looking to discover whether or not the candidate has that special something that will make them a star in the classroom. Our service helps candidates find out – quickly and affordably – how they can make resume for teachers that will stand out in the mind of the recruiter while still being a fast and fun process to create in the first place. Crafting a resume for teachers is our number one priority because children are the number one people in their parents’ hearts. Helping a teacher helps children in turn, and that’s why resume for teachers service is so excited to help design and write resumes for teachers that will help them get the job they want. Take that extra step with resume for teachers services and find out for yourself how we can make the difference in your career prospects. 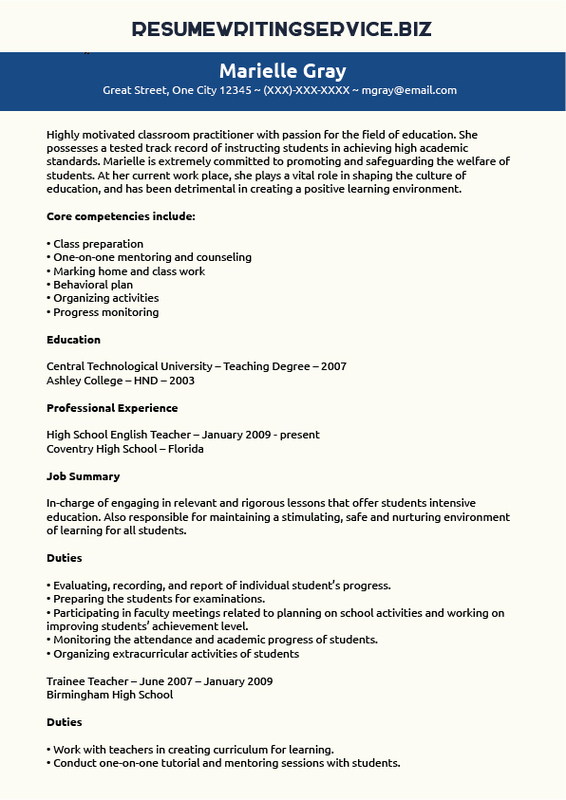 For a high school teacher resume, feel free to contact us now!